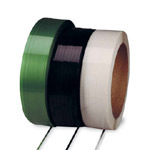 Polyester strapping is a type of plastic strap designed to handle higher loads. 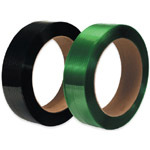 Polyester strapping is can rival steel strapping in strength with the added benefit of being much lighter and easy to use. Polyester strapping can be used in battery operated tensioners for a great increase in efficiency and productivity when compared to steel strapping. Polyester strapping is made from partially recycled material and can be recycled itself. 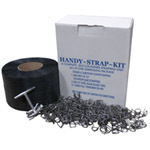 Products commonly bound with polyester strap include lumber, brick and ceramic tile. Boatman Marking offers polyester plastic strapping for both manual tools as well as well as strapping machines.